Hennur Road: Future of Bangalore! 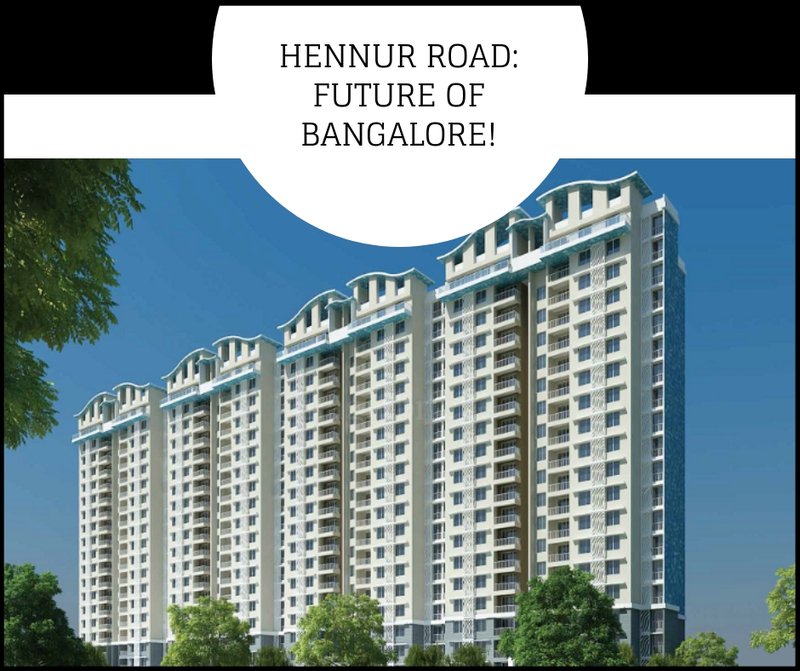 Hennur Road is located at the extremes of Bangalore, it is one of the most desirable destinations for both residential as well as commercial realty in Bangalore. The northern localities of the Bangalore International Airport, that is the main driving force of increase in realty industry. The demand of this is largely driven by the investors who are more than 70%. This is entirely because this locality is still under development. This Road is being extended into a four-lane highway along with a cargo road to develop accessiblity the airport. It is swaddled by the Manyata Tech Park on the Ring Road in the East, Kacharakanahalli, Kariyana Palya,Hennur and Kothanur in the North. The 12 km stretch of this road is to embellish the city in the coming future. The closeness of Hennur and Hennur Road localities to the Central Business District (CBD) also guarantees promising returns on properties. Hennur Road is an upcoming residential area. There are umpteen townships ready for sale on this road. The road steals the show when it comes to connectivity as it is highly connected to major areas of the cities. Railway stations in Banaswadi and Bangalore East are located near to this stretch making commuting much simpler for its inhabitants. The area is prospering with respect to social infrastructure as well. There are many well known schools and colleges that are all in close proximity to residential complexes. The Avhieta Hospital & Healthcare, Medi Derma Hospital,Vasan Eye Care and Cratis Hospital and many other medical centres that suffice for medical care of the region. There are many expensive hotels, entertainment and shopping centres in the area. This area prospective IT hub of the city with many companies like Tyco, Wipro, Beml setting up sites here. Last but not the least it has well maintained green belt embellishing the locality like never before. Bangalore, the IT hub of the nation has influx of residents. Hennur Main Road, which links the Bangalore International Airport with the northern peripheries of the city, is a prosperous real estate investment terminus. This area is observing high returns from investment in property due to its rapid pace. Hennur Road has become a well know spot for property buyers and is expected to give better returns in the years to come. This is all because of closeness to the International Airport, ongoing developmental activities and better connectivity to Bangalore city centre. Purva The Waves is located at. Hennur road, Bangalore. This residential project by the group is ablend of distinct capacious abodes and lovely features. Thisis a best residential realty update to be established. This residential township is extended over 19.5 acres of comprehensive land area. There are 2 and 3 BHK variants of apartments to be advanced in different sizes starting from 1232 square feet to 1846 square feet.The township is loaded with amenities like Meditation Centre, Club House, Kids Play Area, Sports Facility, Gym, Swimming Pool, Landscape Garden, Park, Power Backup, Restaurant, Open Space, Lift et al.The township is located close to the number of linked passages of roads and transport services for easy connectivity.